William Friedkin’s latest is a deeply unpleasant film about deeply unpleasant people. A tale of betrayal amongst trailers, it deals with the sort of people whose baseness comes less from a place of evil than a kind of banality bred from living somewhere where nothing ever happens. It’s a sleazy and scuzzy slice of misanthropy that sees a group of grotesques get in over their heads, and then suffer the horrific consequences of their actions. In short, it’s a Hell of a lot of fun. Emile Hirsch plays Chris Smith, a prospective drug dealer who finds himself at the mercy of the local crime lords: his mother has made off with his supply, without which he can’t earn the money to pay off his considerable debts. As the henchmen who pursue him around town make abundantly clear, he is mere days away from death if he doesn’t find some cash quickly. It’s at this low – though by no means his lowest – ebb that Chris stumbles upon the solution: kill his mother and collect the money her life insurance policy. It’s a plan to which his father (Thomas Haden Church) readily agrees, since they both need the money and don’t think that the mother can possibly serve any useful purpose other than dying. To ensure the hit goes off without any complications, Chris tries to hire ‘Killer’ Joe Cooper (Matthew McConaughey), a crooked homicide detective who carries out contract killings on the side. Chris and his father can’t match Joe’s fee, but Joe is willing to waive it this once if they are willing to provide Chris’ virginal sister Dottie (Juno Temple) as a retainer. Caught between two awful possibilities – allowing Joe to have his sister or being killed – Chris agrees to the deal and waits for Joe to make good on his part. Once Joe enters the lives and home of Chris’ family, his intentions towards Dottie are the very least of their problems. With all its talk of murder for insurance purposes, Killer Joe plays out like a southern fried spin on Double Indemnity, with the dark humour and Faustian bargains of Blood Simple thrown in for good measure. As with James M. Cain’s work, much of the bleak pleasure of the film comes from getting to wallow in the sheer awfulness of its characters, then to experience the giddy schadenfreude thrills of watching things go from bad to worse to even worse, until the story reaches a point where the characters start to – figuratively speaking – devour each other. (A literal realisation of that idea would not be outside the realms of possibility where Killer Joe is concerned.) Tracey Letts’ script, adapted from his own play, expertly ratchets up the dread as the walls close in around Chris, whilst Friedkin’s claustrophobic direction makes great use of the story’s theatrical origins without ever making it feel play-like: even though almost the entire third act of the film unfolds in one room, it never feels limited, just horribly intimate. Although the film is a strong ensemble piece that allows every cast member to shine – Thomas Haden Church gets most of the big laughs as a man so brow-beaten he seems put out by the horrible things happening around him; Juno Temple is convincingly fragile as the naïve bargaining chip in Chris’ deadly game with Joe; Gina Gershon gives a truly fearless performance as the central pivot of the film’s most infamous and stomach-churning scene – it’s McConaughey who towers over everything. Turning his movie star charm to a far darker purpose than usual, his performance positively thrums with unspoken menace, lending a volatile unpredictability to every scene. He’s a monstrous, unnerving yet darkly magnetic presence, so much so that it’s the moments when he just stands and observes that prove most chilling. 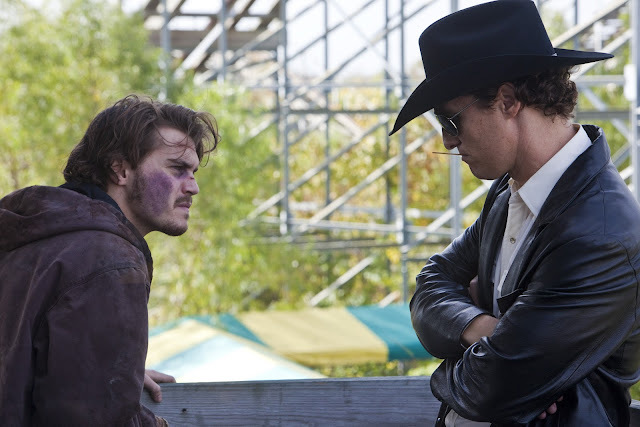 In conjunction with his great turns in Bernie and Magic Mike, Killer Joe confirms once again that McConaughey can be really great when the material is this good. Killer Joe is a depraved and devilish delight, filled to the brim with moments of caustic humour and brutality, crafted by a writer/director team who are so simpatico it’s a tad unnerving, and carried out by a cast who bring everything they can to the table. As such, it might be too bleak and horrible for some viewers, but for those who like to stare into the abyss and have a wry chuckle at what they see, it’s an absolute blast.